George has given several concerts and recitals: XII International Festival “Moscow meets friends”, 2016; “Classical Guitar Days”, Varna, 2016; International Festival “Laureates days Katya Popova”, Pleven, 2014, among others. As a recipient of the Special Prize for Art given to him by the Foundation “Stoyan Kambarev”, 2017, George gave his concert debut as a soloist with the Sofia Soloists Chamber Orchestra, conducted by Prof. Plamen Djurov, on 25 January 2017. George obtained classes with notable musicians, such as George Vassilev, Jorgos Panetsos, Marcin Dylla, Joseph Zapka, Margarita Escarpa, Magdalena Kaltcheva, Oman Kaminsky, Thomas Offerman, Johannes Monno, and Gabriel Bianco among others. 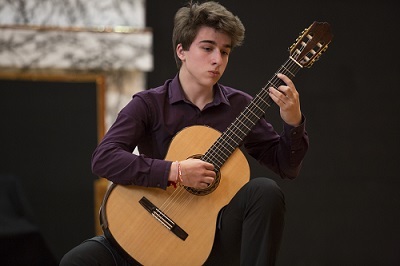 Currently, he is playing on his handmade guitar donated by the Dimitar Berbatov Foundation and crafted by the luthier Christo Georgiev and continuing his studies with Stolina Dobreva at The National School of Music “Lyubomir Pipkov”. If you are interested in working with George., please get in touch with the EMCY Office.